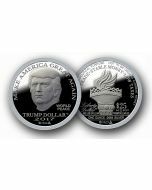 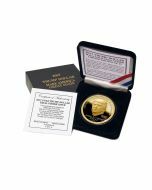 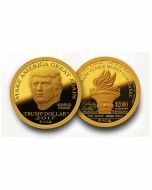 The 2017 PROOF MAGA TRUMP DOLLAR features President Trump and his personal motto: Make America Great Again. 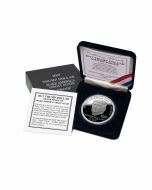 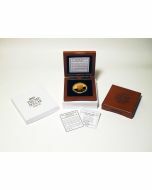 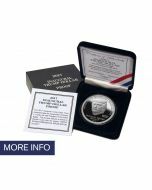 Each Proof is minted in stunning proof condition with six strikes by the proofing press with a special Ultra High Relief (UHR) obverse die to create a deep flawless mirror-like proof finish for a vastly superior quality and eye appeal than the lower relief, brilliant uncirculated issue. 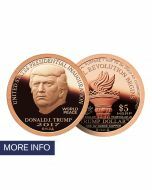 The obverse of the 2017 Copper MAGA Trump Dollar features an original sculpture of President Trump and his campaign slogan and personal motto: MAKE AMERICA GREAT AGAIN and WORLD PEACE. 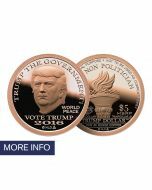 The reverse features the Liberty Torch with the legend FREE TRADE, STABLE MONEY and LOW TAXES as the formula for America to regain its promise for hard working Americans. Each Copper Proof contains one AV ounce of pure copper that is packaged in a tamper proof capsule and a gift box with Make American Great Again and Trump Dollar printed on the outer box with a Certificate of Authenticity. 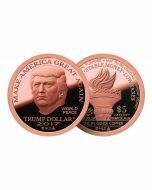 The 2017 Proof Copper MAGA Trump Dollar is $19.95 each.